My friend Lillian Daniel published a lovely book a few years back called When “Spiritual But Not Religious” is Not Enough. 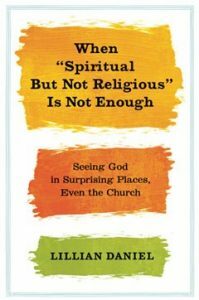 With sparkling wit and uncommon wisdom, she skewers the viewpoint that you can be “spiritual” without being “religious,” that my personal feelings and spirituality actually work out better than trying to be part of a church. I’m with her – in that when I hear criticisms of the church, I wonder Are you really familiar with the church? Who said we’re anti-science, or riddled with rules and guilt, or irrelevant to the real world? Who said we’ve not considered Why Bad Things Happen? Who said we’re just a bunch of hypocrites? Oh, right, that last one was me… We humans tend toward hypocrisy, inside or outside the church. It’s our private hypocrisy, our self-indulgent, narcissistic way of thinking that desperately needs a church. Admittedly, many churches have failed. People have been wounded by the church. We are sorry. But the church I know, the church that has blessed me so very richly, is a good, optimistic place where you can be you, and you get the benefit of being with others in this quest of faith that need not be so lonely. God made us for community – and not just with people who echo our biases back to us. What grieves Lillian, and me, is that the spirituality that shuns church and whatever is religious is too thin, a pretty but flimsy house of cards that works so well when you see a sunset or your marriage is happy or you just got a promotion. But I want a faith that can weather sorrow, catastrophe, the shock of loss, the agony of loneliness. I want a faith that isn’t cute but profound. I want a faith that isn’t about me. I want a God who is God, as I am not very good at being God – which all the narcissism in our culture, and in non-religious spirituality, presses me to be. Church doesn’t cuddle up to our culture very comfortable, and it calls us out of our narcissism. Thankfully. I want what God wants, and acknowledge at the outset that it’s not exactly what I’ve been wanting for me. I need help, friends, and even an institution to stick with this pursuit. That’s why Church Matters.